Spring onion is from the Onion family and is also known as green onion or scallion in some countries. We may call it with different names but the health benefits are same all over the world. They are found all round the year in the market and the most interesting part is you can regrow it in your home very easily. First and foremost, it lowers the blood sugar level. It has been found that the sulphur present in the spring onion helps in lowering the blood sugar level. It also helps in reducing the risk of coronary heart disease. They are full of antioxidant which helps in preventing damage of the DNA and tissues. It is rich in vitamins such as vitamin-c, vitamin-B2, vitamin-A, vitamin-k. Spring onion is also a good source of magnesium, copper, potassium, copper and fibre. The antibacterial properties help to fight cold and flu as well as digestive problems. They can also be used as an appetizer as they help to cure indigestion. It improves bone density. As mentioned earlier the high levels of vitamin c and k present in spring onion helps in the normal functioning of the bone and maintaining the bone density as well. Green onion also helps to maintain the normal vision of the eyes and keeps the eyes healthy. The various minerals present in it helps to fight different infections; vitamin C protects the body tissues from damage. The vitamin B1 of spring onion absorbs by the blood and reduces stress. According to me, this is one of the best advantages in today's stressful life. You will be surprised to know that just adding this simple vegetable to our diet will reduce the risk of Cancer in our life. 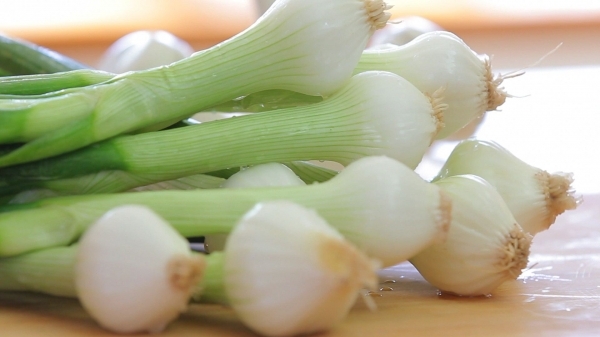 Pectin present in spring onion reduces the risk of colon cancer. Allicin present in this vegetable is very good for our skin. It helps in reducing wrinkles. It is also good for regulating metabolism hence reduces weight. Scallions help to reduce the cholesterol level too. It helps to cure asthma as well. This food is low in sodium and saturated fat. Thus, it is a food which is a must-add in our diet. It is very easy to use spring onion in Indian recipes, spring onion bhajji being a famous dish of the Maharashtrians. You can use it as a garnishing item in non -vegetarian as well as vegetarian dishes; it gives a nice crunch to the recipe. It is a complete set of health and taste!